Are you still dubious about what content marketing can bring to your business? You're not alone. Many small business owners think that content marketing strategies are a method only big brands such as Red Bull are able to utilise effectively to engage their customers and increases their brand affinity. However, this is simply not true. Any business regardless of marketing budget or resources is able to develop innovative on-brand content marketing and moreover is an essential element in any online digital marketing strategy that should not be disregarded. These statistics make it no surprise then that by 2019, many businesses will be increasing the time and money they exert on content marketing creation, with some predicting their digital investment to take-over up to 50% of their marketing budget. "A marketing technique of creating and distributing valuable, relevant and consistent content to attract and acquire a clearly defined audience – with the objective of driving profitable customer action." The important part of this definition is the description valuable, relevant and consistent. Content marketing involves the making of media and publishing including blog posts, podcasts, videos, infographics, white papers, how-to guides, etc. to acquire and retain customers. Content Marketing has become a key inbound marketing technique which businesses have used to engage their target audience. It changed the marketing landscape as small businesses are now able to compete with big brands to gain exposure, increase sales and improve brand awareness. Not only that, but content marketing is now one of the key methods for improving SEO by fulfilling the search queries the SEO is targeting. In order to take advantage of this marketing tactic your business must first assess its market and develop a content marketing strategy. Creating a content marketing strategy is a key part to your over-arching marketing strategy. Whilst uploading content as and when you can is good, setting up a calendar planning out your posts and promotion will be a much more effective strategy long-term. To begin, you should first assess your customer base and target market. From this you should be able to distinguish the content they are most engaged with. Create a list of potential areas of interest, for example for a dental practice website you may wish to create blog posts explaining cosmetic dental procedures, after-care and dental health tips. You may also be interested in profiling the dental team to help show your expertise and gain the trust of visitors to your site. Look at competitors in your industry to see the kind of content they create and seek ways to replicate this for your business. A content marketing strategy should use your brand story as a basis for the message in your content. Keeping your aims consistent will help improve your brand. You will also need to decide on the channels that you are going to share your content on: website; blog; social media; etc. For each you should have clear objectives and monitor when you receive the best engagement. Tailoring your content and upload schedule to this will improve your content marketing strategy. For many businesses lead generation through content marketing is indirect. When a potential buyer conducts a search for a product or service in your business category, they are actively looking to solve a problem they have or find out more information about a topic they are interested in. By creating content that is targeted towards particular search queries you can attract the attention of these customers. Another way to increase your leads is to create an information book or guide that requires an email sign-up to access. Once you have gathered a list of email addresses (who have agreed to receive news and updates) you can begin an email marketing campaign. Lastly, you should always remember to share your content on Social Media, and not just when you first upload it. People who then share, like or comment on your posts can become potential leads as they have actively engaged with your business and have shown an interest in your industry. One way to improve conversion through content marketing is simply be maintaining a consistent presence. For many businesses, content marketing a long-term strategy with the aim of enhancing awareness and establishing yourself as a credible and trust-worthy business. The more a potential customers sees your brand and presence the more they will become aware of you. Over time this can increase the chances that when they come to require your product or service they will come to you to purchase. Setting up a regular schedule for your posts will help you to remain on customers' radars. You can also use social media management software such as Buffer or Hootsuite to pre-schedule social media posts and depending on your website you may also be able to pre-schedule blog posts. It is important that your content provides real value to your customers. When customers feel they have benefited they will be more likely to choose you when it comes to purchasing. There is a balance in content marketing between content which educates or engages with your target market and that which sells. Remember to include a link to your website or business logo on any content that you create so if your posts becomes viral your business will benefit. Would You Like a Professional Looking Website You Can Edit and Manage Yourself? Running a website for your business may seem like an expensive and perhaps unnecessary addition if you are not looking to sell online. However you should not underestimate the importance of having an online presence. For those who haven't heard of your business, search queries on search engines can help to generate leads you may not have had initially. 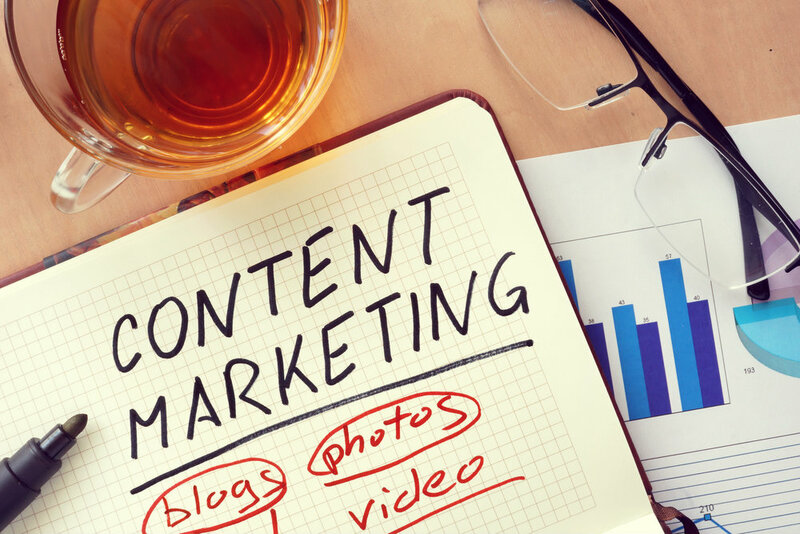 Content marketing can help solidify a current or potential customer's perception of your brand and you don't need to have an elaborate content marketing strategy to reap the benefits content creation can bring. Kommand website builder offers business owners a simple and cost-effective to run a CMS website for your business. Our packages start from as little as £9 a month and all of our themes are mobile responsive. To find out more and boost your business's online profile you can view our tour here. Or to discuss your business and its needs you can contact the Kommand team.